The aperture of your mount will be cut to fit the selected size. Read our aperture measuring guide.. Your aperture should be slightly smaller than the piece you're mounting. Read our help notes on mounts..
Read our border measuring guide..
Read our guide on glazing options.. This quality acrylic is highly transparent and widely used by the picture framing industry. It is light and very strong, making it ideal for larger frames and easier to transport. Don’t be put off by acrylic, it’s nothing like the thin plastic acrylic of old. It’s now the material of choice for many gallery and museum collections. A high quality clear 2mm thick ‘float’ glass giving a superb glazed finish to any art. Because of its fragile nature we can only offer glass on smaller frames - and this website will help you select the right glazing for your size of frame. Glass can have a distracting reflection, especially if there is light (such as a window) behind you when viewing a glazed frame. Non reflective glass is slightly ‘diffused’ and greatly reduces any glare from reflected light. Your frame comes complete with all the required and recommended hanging fittings as standard. If you want anything extra you can add them here. If you switch to Standard Size frames you will lose all custom changes you’ve made to your current design. Do you want to start a completely new design or continue editing your current design? You can measure and enter your initial dimensions in cm or mm, but we will convert this to millimetres and use this measure throughout the rest of the Frame Designer. For a frame without any mount, you simply need to enter the height and width of the piece to be framed. 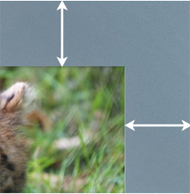 So if you want to frame a picture that is 300mm high by 200mm wide, just enter those dimensions. We’ll make the frame so that your piece fits comfortably. 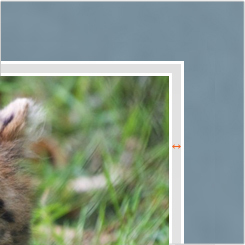 Note: Every frame has a small ‘lip’ that overlaps the edge of your picture. For this reason, if the item you’re measuring is already in a frame, make sure you first remove it from the frame and carefully measure the exact size of the piece. All you need to tell us is the exact height and width that you’d like the mount aperture (opening) to be. We will cut it precisely to the size you enter. Your aperture needs to be a little smaller than the image you want to mount so that you can position the picture behind the mount (and so it doesn’t fall through!). We’d suggest allowing at least 2.5mm on each side. You may wish to display an area of white border that’s part of your picture. Again, you simply need to enter the exact aperture you require. 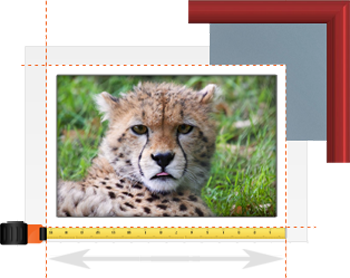 The size of the mount borders you enter will set the width from the aperture to the outer edge of the mount. So adding borders of 100mm to all sides will make the overall mount size 200mm wider and taller than the aperture size you gave us. Note: Every frame has a small ‘lip’ that overlaps the edge of the mount (and keeps it in place). 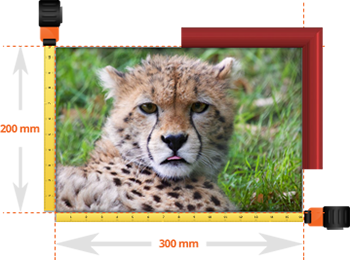 The lip size varies depending on the frame, but approximately 5mm of your mount will be hidden under the lip on all sides. 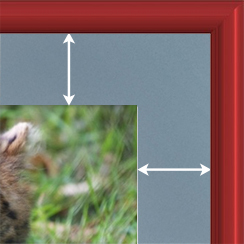 If you have selected a ‘Standard Size’ frame then we have pre-set suitable mount border sizes for you. 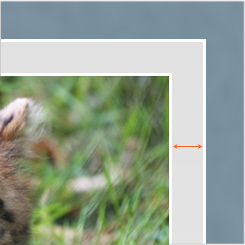 If you want to control all sizes you can switch to ‘Custom Frame Sizes’ in section 1. 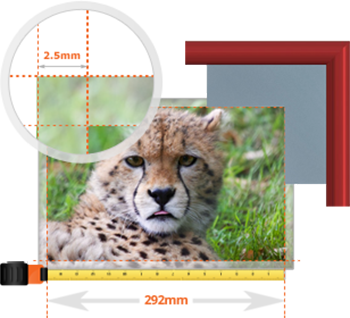 The size of the mount borders you enter will set the width from the aperture to the outer edge of the mount. Note: Approximately 5mm of your mount will be hidden under the frame ‘lip’ on all sides. Adding extra mount layers to create a double mount does not increase the width of the overall mount. The width from the aperture to the outer edge of all mounts will always be set by the mount border sizes that you enter. Offset: If you choose to add a double mount, you just need to tell us the ‘offset’ between each layer. The offset you enter will be the amount of mountboard showing beneath the upper layer. For instance, if you have a blue top mount and a grey second mount, and you enter the mount offset of 7mm, you will see 7mm of pale grey mount showing beneath your blue top mount. Easy! For double mounts, you just need to tell us the ‘offset’ between each layer. The offset you enter will be the amount of mountboard showing beneath the upper layer. For instance, if you have a blue top mount and a grey second mount, and you enter the mount offset of 7mm, you will see 7mm of pale grey mount showing beneath your blue top mount. The higher the offset, the more of the second mount you’ll see. Adding extra mount layers, or altering the offset, does not increase the width of the borders nor the overall mount. The width from the aperture to the outer edge of all mounts will always be set by the mount border sizes that you entered in the ‘Sizes’ section of the Frame Designer.